Have you heard of CrossFit? Of course you have. It’s everywhere these days. But what exactly is CrossFit? In essence, it’s a high-intensity workout program designed to keep your body moving and to work out as many muscles as possible. It’s rigorous. And with the right assistance, the results are superb. Each of the following 10 gyms have coaches that will give you their all to make you your all. CrossFit Stimulus offers hands-on coaching with specific classes, timekeepers, and motivators. 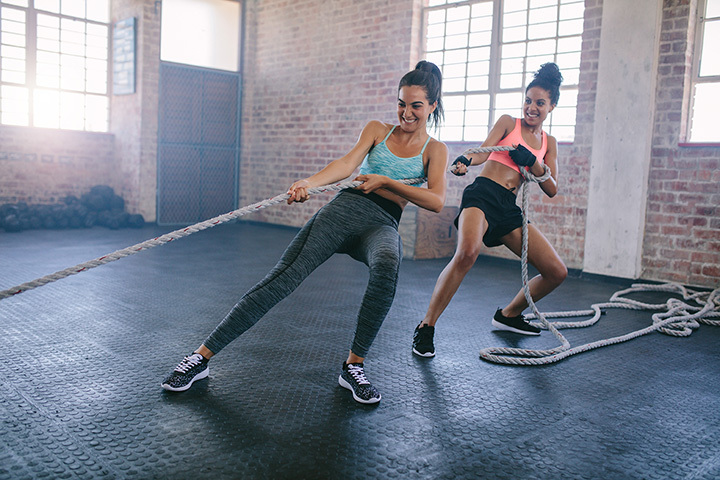 CrossFit can be intimidating for beginners; that’s why they’ve created a 30-Day Jump Start Challenge to get the ball rolling. Colonial CrossFit offers a free workout to get you started. Their group classes will teach you the basics of gymnastics, bodyweight movements, weightlifting, running mechanics, and more. Military gets an additional 30 percent discount. At CrossFit Norfolk, the coaches are focused on teaching members new skills, developing strong bodies and minds while helping you lose weight. They have an extremely friendly culture, which is helpful to anyone working out for the first time. CrossFit Forward brings the CrossFit revolution to Fredericksburg, Virginia. They offer a free introduction class and open gym time for you to come work out on your own when there aren’t classes. They have workouts that change daily and pay special attention to making sure you’re comfortable before getting the workout started. Valiant CrossFit is an all-around great option, whether you’ve been working out for years or are looking to get back into the gym. But newbies, keep in mind: this can be an intense workout, and the coaches at Valiant “will only accept dedication.” They want you to embrace the CrossFit lifestyle, and all that it entails. Drachen CrossFit in Williamsburg, Virginia is unique in that it offers wonderful coaching opportunities for adults in addition to CrossFit kid’s classes. These classes are specifically attuned to maximize a workout for a child’s body while sticking to CrossFit principles. What more could you ask for in a kid’s workout? RARE CrossFit in Fredericksburg, Virginia has won multiple awards, including “Best Health Club” and “Best Personal Trainer” as voted on by The Free Lance-Star newspaper. Come on in to experience the RARE treatment in a free 45-minute class. New to training? Consider their fitness bootcamp. Ardent CrossFit in Stafford, Virginia is focused on giving customers plenty of reasons to choose them. They provide free child care for all customers while they work out. Members of the US military qualify for special plans and pricing. They also offer CrossFit Kids classes and a free intro session. A recent reviewer of CrossFit Virginia Beach wrote, “You walk into the gym and the first thing that hits you is ‘WOR’. This is not your every day run-of-the mill global gym where Hanz and Franz work their beach muscles.” The staff does everything in their power to make sure your workout is as impactful as possible. CrossFit Bezel brings CrossFit to Mechanicsville, Virginia. Their website has tons of great information, including a paleo recipe of the day, a training journal, and links to nutrition partners. You can also check rates and see upcoming classes, too.